Why audio visual systems are automotive sectors secret weapon? According to a study by Accenture, “75 percent of drivers polled would consider conducting the entire car-buying process online.” This could spell trouble for traditional car dealerships that can’t keep up with digital innovations. Today, when consumers walk into a dealership, they come armed with information–they already know the fair market price for the car they want, including the options that are available to them. There is still a place for bricks-and-mortar dealerships, overall consumers still find value in test driving and seeing options in person. The role of the dealer, therefore, is not just to move product, but to deliver an exceptional experience to further reinforce the consumer’s engagement with the brand. At the same time, the purpose of the car dealership is changing rapidly; the days of the hard sell are over. The salesperson has morphed into the product specialist according to Autotrader. This includes luring potential customers with specials, offers, service deals and warranties that they wouldn’t otherwise find online. But it doesn’t stop here. Car dealerships need to respond to the increasingly digital environment by ensuring a seamless crossover into the real world. One way to accomplish this is by taking advantage of interactive audiovisual systems. The Rockar Jaguar Land Rover showroom in Westfield Stratford Shopping Centre showcases a spectacular display that includes 5 internal video walls providing branding, aspirational and tactical messaging and a huge custom designed 12 screen video wall in the window, which rises on the hour to reveal a hero car providing real ‘wow factor’. 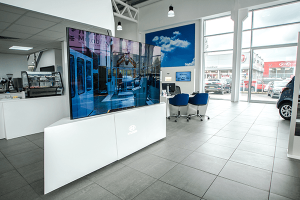 Widely noted as leaders in the use of AV technology in the automotive sector, Rockar showrooms in Westfield and Bluewater entice potential customers by allowing them to browse, test-drive, trade-in their old car or buy a new car by simply touching a screen–without having to interact with salespeople– giving the customer complete control of their brand interaction. It’s also important to keep in mind that consumers deserve a consistent brand experience across dealerships, and across online and offline channels. A potential Hyundai buyer in Brighton should have a comparable experience as a Hyundai buyer in Manchester. We helped Hyundai take advantage of digital signage and video displays to maintain a consistent brand look and feel in a way that analog displays couldn’t. It didn’t take much. An audiovisual solution could include a single screen with centrally controlled content. This allows for easy deployment of consistent campaign messaging and can be tailored to the individual vehicle on display. While digital solutions can be an innovative way to draw attention to a dealership, it’s crucial to get the technology right. Partnering with audio-visual experts who can help design, install, measure, and maintain your digital displays can be a huge help towards delivering long-term efficiencies, creating brand loyalty and ultimately moving more product. Welcome to the new normal! How content management systems are driving the adoption of digital signage.